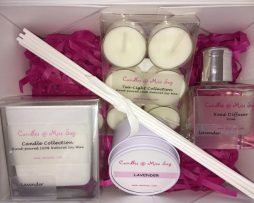 We are delighted to announce our new gift boxes, two options available. The white A5 deep box (w)23.5cm x (d)17cm x (h)10cm) comes with a grosgrain ribbon, lined with pink shredded paper, complete with a magnetic front flap closure. 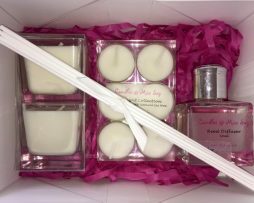 Our gift selection contains a box of 6 scented tea lights, glass cube 8cm soy wax candle, glass cube reed diffuser (lasts over 3 months) with white porex reeds and a white travel tin.